Birmingham Royal Ballet's Beauty and The Beast tells the tale of a beautiful girl named Belle who's father promises her to The Beast after he picks a rose from the chilling castle. The Beast asks Belle to marry him time and time again, although Belle does not love him back and he begins to perish of a broken heart. Also with appearances from Belle's arguing sisters, greedy Cochon and the mysterious Wild Girl. Its a tale we all know and love. 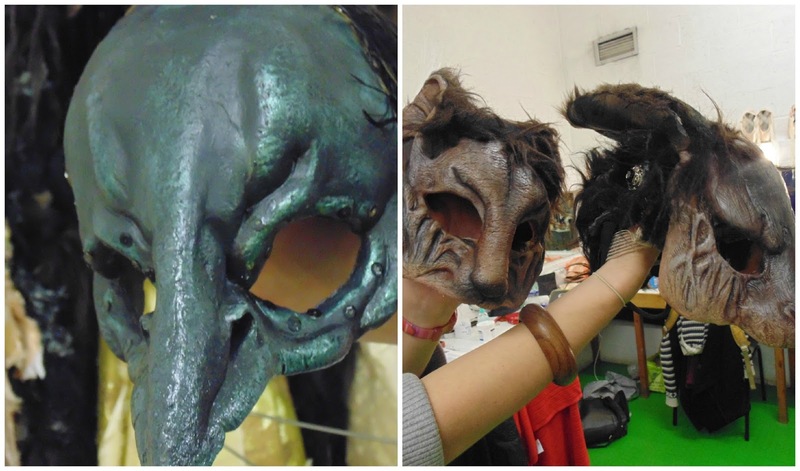 I was invited by my local theatre, The Theatre Royal Plymouth, backstage at BRB's tour of Beauty and The Beast to check out some of the makeup, wigs and costumes for the show. 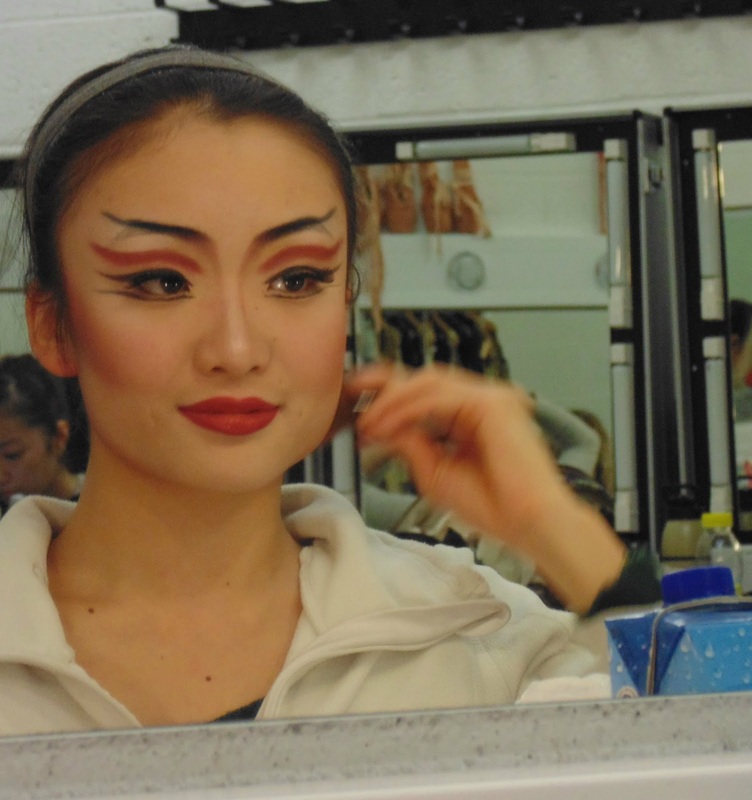 Firstly I had the opportunity to meet Yaoqian Shang who was playing Wild Girl in the ballet that night- the only character in the show who is actually turned from an animal into a human by the Woodsman, the rest are turned from humans to animals. Yaoqian sat down at her dressing table a premature two hours before the curtains opened (just in case her makeup goes wrong and has to start again!) to begin transforming herself into a magical fox looking character. I was somewhat surprised that the dancers did their own makeup entirely by themselves; I had preconceptions that a makeup artist would be rushing around making up everybody before the show but that was not the case at all. The dancers bought all of their own makeup- not thick stage makeup like I had imagined, but everyday makeup that you and I wear. Yaoqian had a huge variety of branded bottles and palettes sprawled across her dressing room table, ranging from Mac Studio Fix Fluid Foundation to Bobbi Brown eyeshadows in deep plum colours to use as a strong contour in the hollows of her cheeks to portray a chiseled, foxy look. Although Yaoqian possessed all of this beautiful makeup, she confessed that she rarely wore a face of makeup outside of work but her favourite brand to wear on stage is Mac due to its good quality and variety of colours. 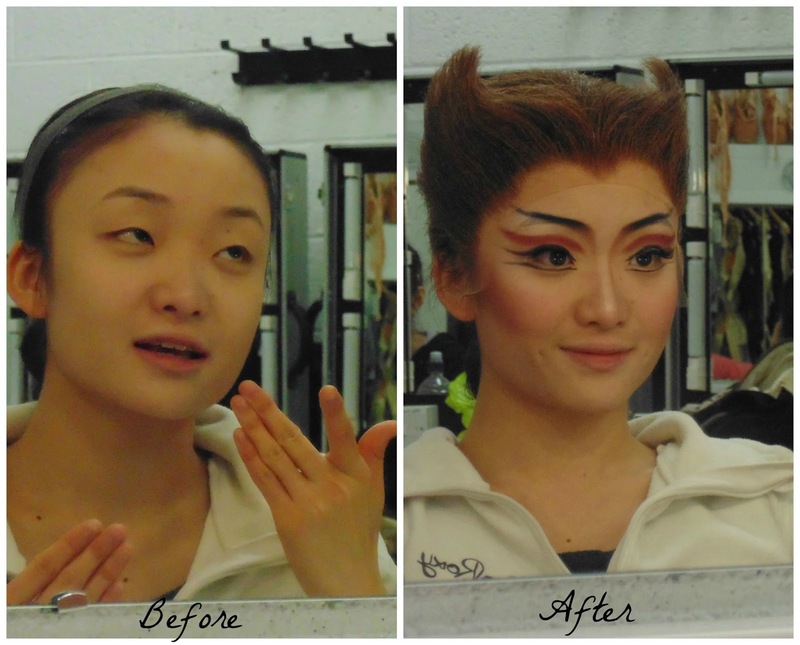 Yaoqian joined BRB in 2013 and told me that she just had to experiment with her makeup to look right for her role but fortunately she managed to get some tips from a previous dancer who played the role of Wild Girl a few years before. The most difficult part of the makeup look for her was the eyebrows which had to be raised and lengthened to achieve the look inspired by woodland creatures- she had to balance both eyebrows out a few times (just like I am with eyeliner!) but she said to remember that "they are sisters not twins"! She used a dramatic winged liner on her lids and a mirroring liner under the eyes along with fluttery fake eyelashes to make her eyes appear wider and doe- eyed. I really love the makeup look that Yaoqian wore for her role, with toned heavy contouring and slick liner, and she applied it so well and looked great. Yes, their dressing room mirrors are actually surrounded by those Hollywood style lights! I then went to meet Jonathan Payn in his dressing room who was playing the role of Cochon that night; Cochon is a wealthy townsman who courts both of Belle's sisters in the show. The character is extremely greedy and money- obsessed, therefore acquires pig- like features. Jonathan is one of the most experienced dancers of the show, dancing for 11 years as Cochon, so is very comfortable with the process of getting ready into his character. As his character is so pig- like, he creates a makeup look that resembles a pig as much as possible. He draws on harsh black brows that are raised and lengthened to make his face appear rounder. To emphasize the pig-like features, Jonathan puts sponges inside his cheeks to puff them out and keeps them in for each scene he appears in! He also applies heavy contour, using dark colours to emphasize the parts of his face going inwards and light colours to emphasize the parts of his face puffing out, such as the apples of his cheeks. Of course, he has a prosthetic pig's nose which he glues onto his face which finishes the look completely. 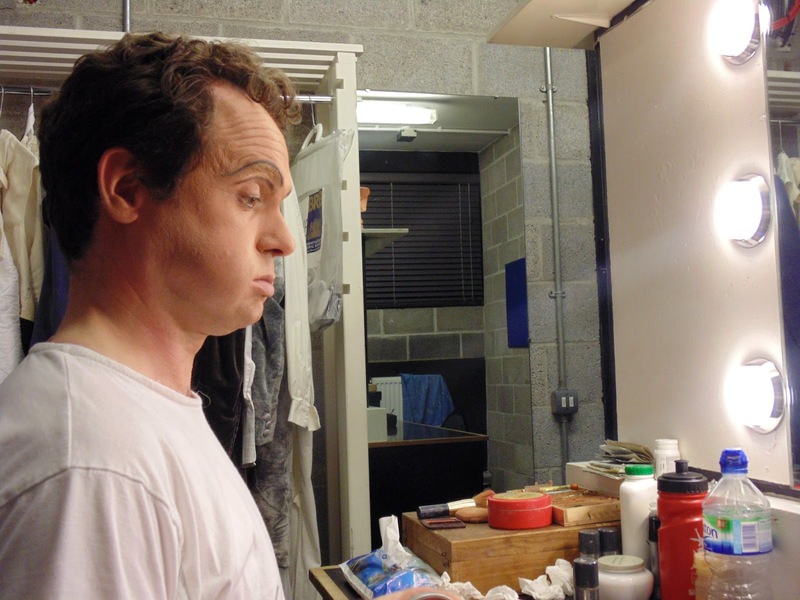 Jonathan wears a fat suit during the show and also an extravagant curly haired wig. All of the wigs in the ballet are made of real human hair but sometimes they are required to dye it different colours if it doesn't match the specification. 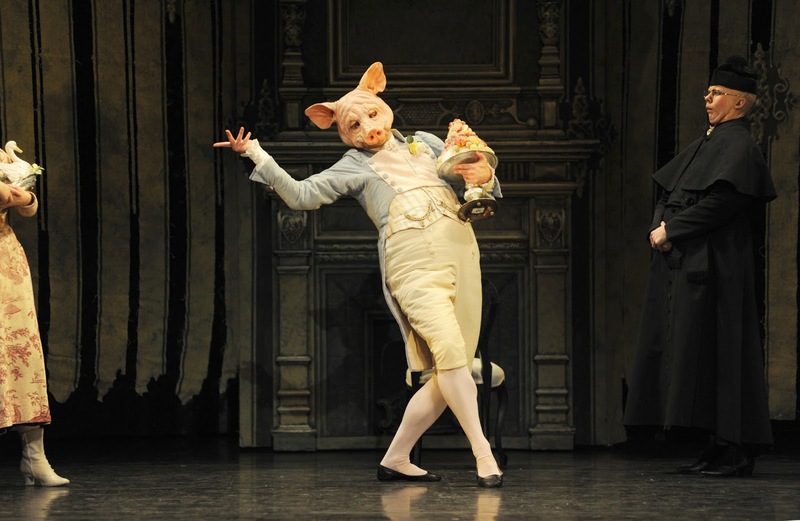 In Cochon's second scene his greed becomes excessive and he turns into a real pig! The costumes were simply stunning for this ballet. They were full of different textures from tulle to velvet and organza. 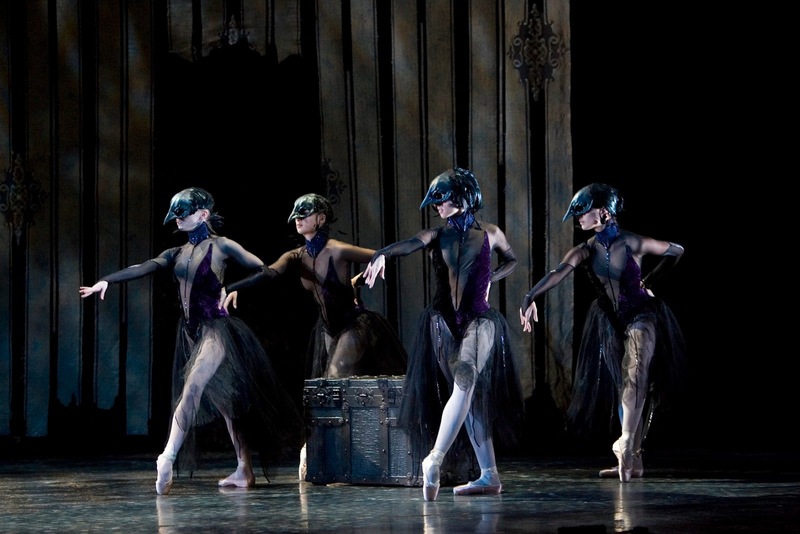 I had the chance to look at the dresses which the dancers wore as part of the bird scene dance (the dark coloured dresses, pictured) and the beautiful party dresses as worn in The Beast's ball (the golden dresses, pictured). What surprised me was that each dress was different- they were not remakes of each other but every one seemed to have its own personality with slight unique details. So much talent and skill had been put into these costumes, and they had lasted amazingly as they have never been replaced after 11 years of show time. I really enjoyed my first backstage experience of the theatre- all of the BRB and Theatre Royal Plymouth team were lovely and I learnt so much. Keep an eye out on my blog for another post about BRB's Beauty and The Beast where I will be talking about the props, staging and a review of the whole show! Disclaimer: I have worked with the Theatre Royal Plymouth and Birmingham Royal Ballet to create this post but all thoughts and opinions are 100% my own! Photos marked with an asterisk are credited by Birmingham Royal Ballet. The makeup looked on point! Wonderful! The whole show looks fab and especially the makeup is awesome. As for improving the skin and making it look younger ,www.cosmedocs.com/treatments/skin-peel-treatment.php provide range of skin rejuvenation treatments.